Welcome to our review of the Dualit 40352 4 slice toaster. A very respected brand produces this handy and useful small kitchen appliance. 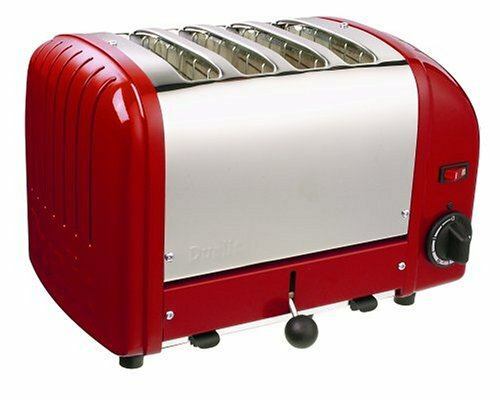 It is without question, a toaster that would look great in any kitchen, traditional or contemporary. This is a commercial style toaster and is used in many hotels, guest houses and B&Bs. Most people should be able to find a colour that will match in with the decor of their kitchen. So we know it looks good, but does it do what is says on the tin? Well it has quite literally sold in its thousands. Buyers give this one an overall satisfaction rate of 82% and that in the world of toasters is very good indeed. It has an average price of around £140, so although not a cheap option, it gets great reviews by actual buyers. It can also handle crumpets, bagels, rolls and small baps. Best of all it can quickly double up as a sandwich maker. It works great with frozen bread as well. This Dualit toaster can be set for doing either 2, 3 or 4 slices at any one time. The controls are simple to use, but they feel really solid. That is a good thing. The toasting time is set with a manual timer, and that allows you to have full control over how you like your toast to be. This is not a “pop-up” toaster. When it is finished, you push down on a knob when you are ready. That means you are not running like a mad thing, when the toast suddenly pops up. The added benefit of that, is that your toast stays warmer, and is ready when you want it. It also has a crumb tray to avoid any mess. You quickly and simply slide it out to empty it. It measures 38.8 x 26.6 x 24.6 cm and weighs 4.5 Kg. The power lead is about 3 feet long and close to one metre. It is certainly not cheap. You are however buying a high quality, top of the range toaster. It works well on all types of bread, and by anyone’s standards, it looks fantastic. A small number of buyers were disappointed, but that appeared to be more about the price tag. You get the usual comparisons here, in that they could have bought 5 toasters for this price. I guess you could say the same about a cheap car and a Rolls Royce.